My thirteen year old is looking for a entertaining book to read this summer so she can take an A.R. test when school starts. She is into romance, with a little action, and something that you just can't put down. She enjoys something with a good plot. If it is a series she wants something that leaves you hanging at the end and makes you want the next book. She has read all Hunger Games, Series of Unfortunate Events, and most of Harry Potter. If you know of any good books on a sixth to seventh grade level please let me know. Hatchet by Gary Paulsen, followed by Brian's Winter and The River, Island of the Blue Dolphin by Scott O"Dell.. Tom Sawyer by Mark Twain. Sign of the Beaver. Jasmin. My Side of the Mountain. Mrs. Mike. To Catch a Killer. Big Red. Two Against the North by Farley Mowet. The Incredible Journey by Sheila Burnford.-- These are all classic titles, nothing trendy or new. I am sorry I don't remember all the authors. Your library should have many of these titles, or should be able to order them in for you. These books have strong plot, wonderfully drawn characters (even if some of them are animals! ), and are very worthwhile reads. They are strong on themes of self-reliance and independence, and Mrs. Mike, Island of the Blue Dolphins, and Jasmin have strong female characters having adventures. Your daughter has read some good books, but she should branch out into classic tales. 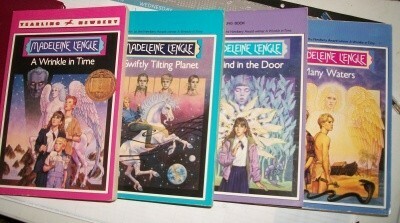 I highly recommend the Madeleine L'Engle's four books. The first is "A Wrinkle in Time", the next "A Swiftly Tilting Planet", then "A Wind in the Door" and finally "Many Waters". They deal with a family who's intelligence, determination and unique gifts take them to places no one have ever gone before...and I don't mean "space", either. I loved them as a kid and still read them from time to time...and I am 57. Here is what they look like. Poor But Proud 's choices are great as well!!! L'Engle's books are sci-fi/fantasy. Good stuff. 1) If she liked the Harry Potter books, I strongly recommend The Book of Three and the other books in the series by Lloyd Alexander. "An assistant pig-keeper who longs for adventure gets more than he bargained for when his pig runs away. As he pursues her through the magical land of Prydain, he encounters an evil enchantress, deathless warrior and the mysterious, masked Horned King." 2) The Narnia books are always good. 3) A daughter's friend is reading Kathryn Lasky's 15-volume "Guardians of Ga'Hoole" series and she loves it. Try the "How to Train Your Dragon" books, or the old Nancy Drew or Hardy Boys books, or some of the classics like Treasure Island, Black Beauty, or The Three Musketeers.